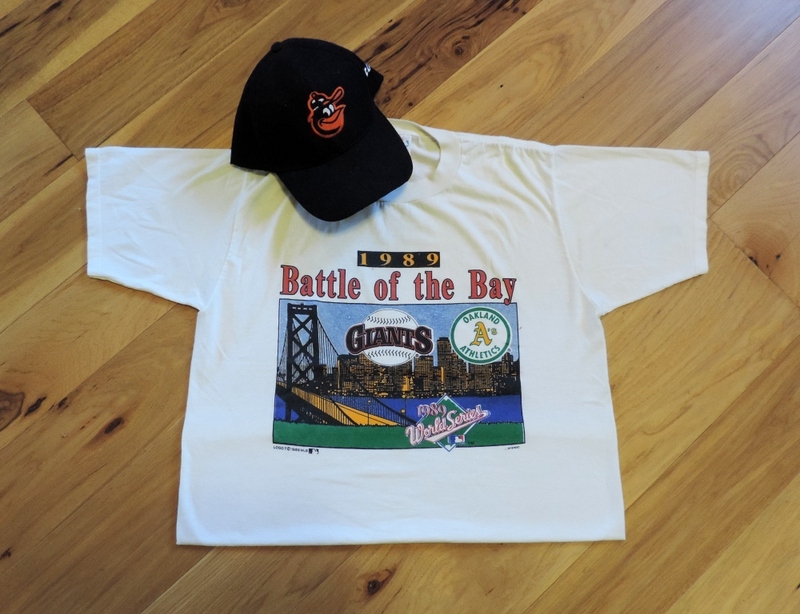 On July 13, 1991, in a game in Oakland versus the A’s, Baltimore Orioles starting pitcher Bob Milacki threw a no-hitter. So did Orioles reliever Mike Flanagan. 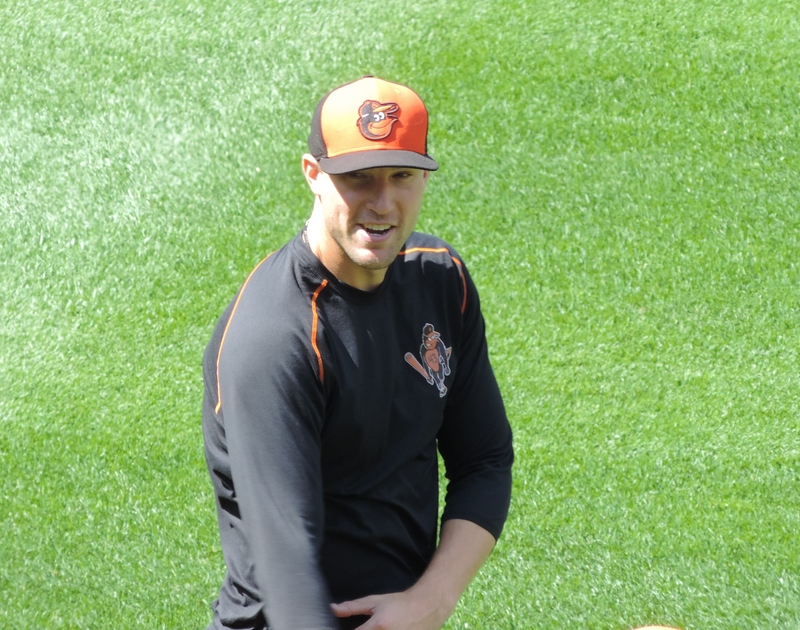 And, so did Orioles relievers Mark Williamson and Gregg Olson. It was a four-pitcher no-hitter. Not unheard of, but kind of rare. In a game that prides itself on the power of teamwork, there’s an awful lot of focus on individual performance in baseball. No hit is no hit. And, the A’s, including Jose Canseco, Harold Baines, Mark McGwire, and a young Mike Bordick, no hit that day. Sure, there are a few of you Giants and Dodgers fans who are so used to no-hitters that you’re a bit surprised to learn that one team has never even had one. Seven pitchers had no-hitters last season – five came after the All-Star Break. But, see! 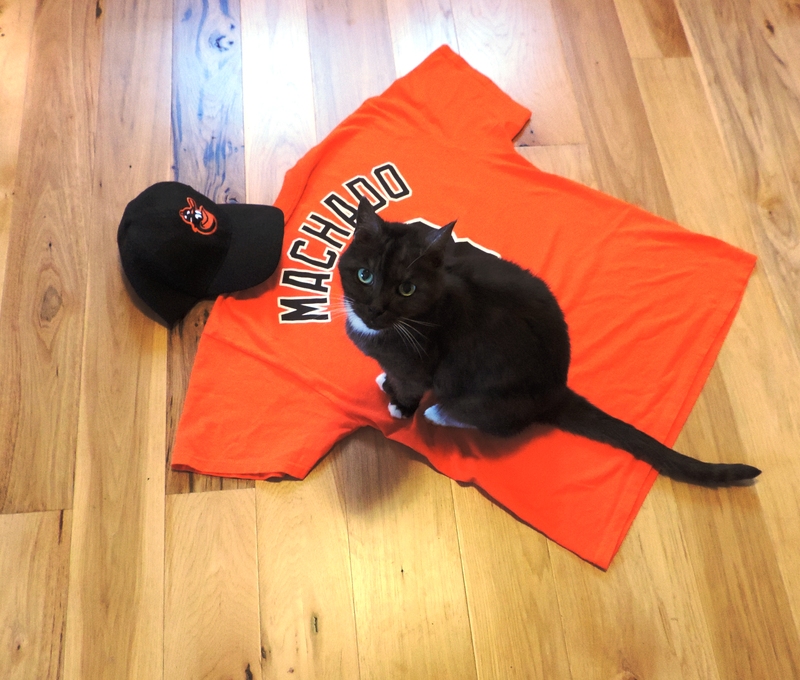 Even I have wandered off into the land of individual excellence and in less than 200 words, I’ve abandoned those four Orioles pitchers – including two (Milacki and Williamson) that even seasoned Orioles fans don’t really remember – and this is supposed to be about them. Since becoming the Baltimore Orioles in 1954, there have been only five Orioles no-hitters. Hoyt Wilhelm versus the Yankees in 1958. Steve Barber and Stu Miller versus the Tigers in 1967. Tom Phoebus versus the Red Sox in 1968. Jim Palmer versus the A’s in 1969. 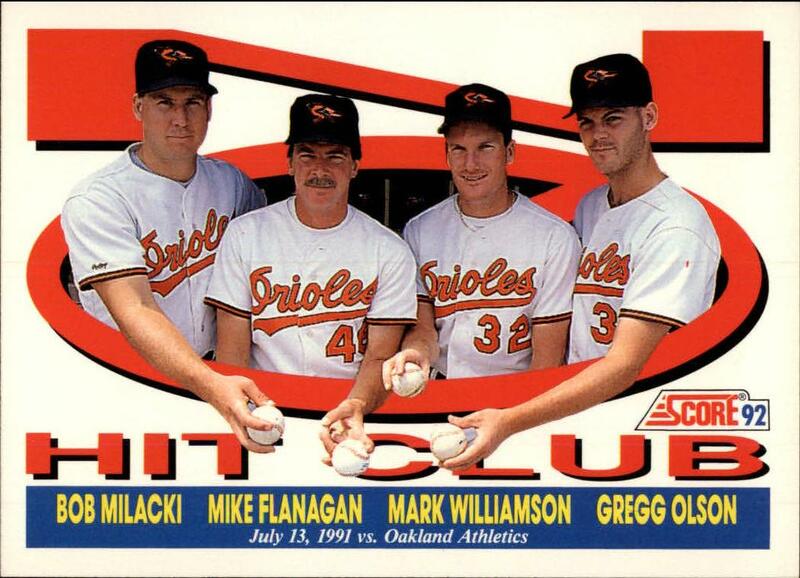 And, Milacki, Flanny, Williamson, and Olson 25 years ago this past week. See, even Getty Images can’t get the game straight. Olson threw one no-hit inning. Milacki threw six. Flanny and Williamson, one each. Oh, for crying out loud. 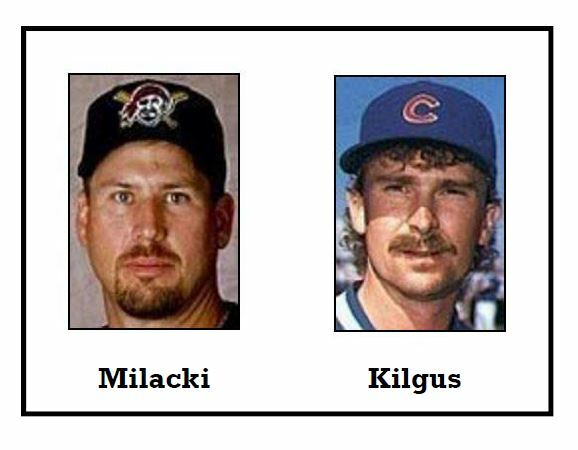 That’s Bob Milacki on the left, not Paul Kilgus. Come on people, how hard can it be? These four pitchers threw a combined no-hitter! Milacki was cruising through six when he was hit on the hand by a comebacker. That might have done in both Milacki and the no-hitter. 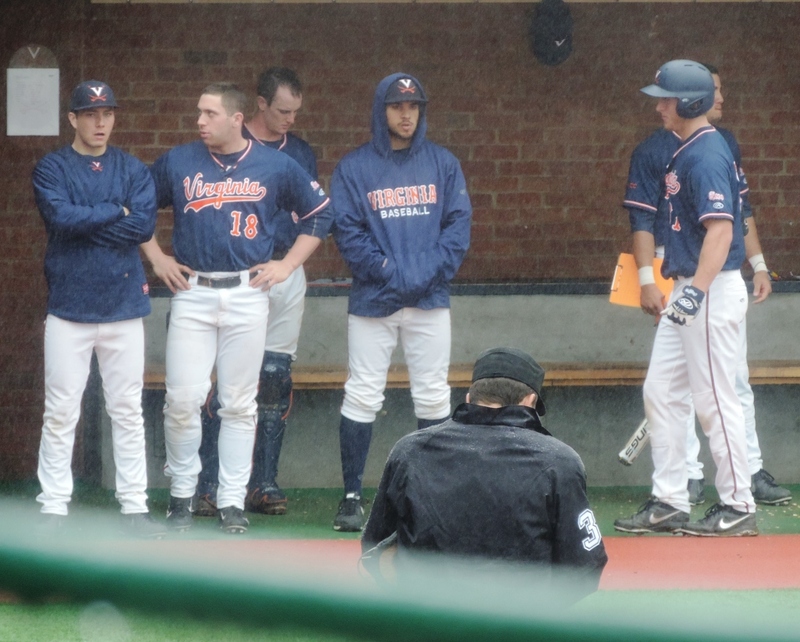 But, the ball ricocheted off his hand and bounced right to first baseman Randy Milligan for the out. Milacki’s day was done. Although bruised and swelling, his hand wasn’t badly injured, and he argued to stay in the game, to no avail. The Orioles scored just two runs – catcher Chris Hoiles batted in beloved utility guy Chito Martinez in the fifth and outfielder Mike Devereaux homered in the sixth. Flanagan, Williamson, and Olson each pitched one hitless inning. The game ended. The Orioles won. 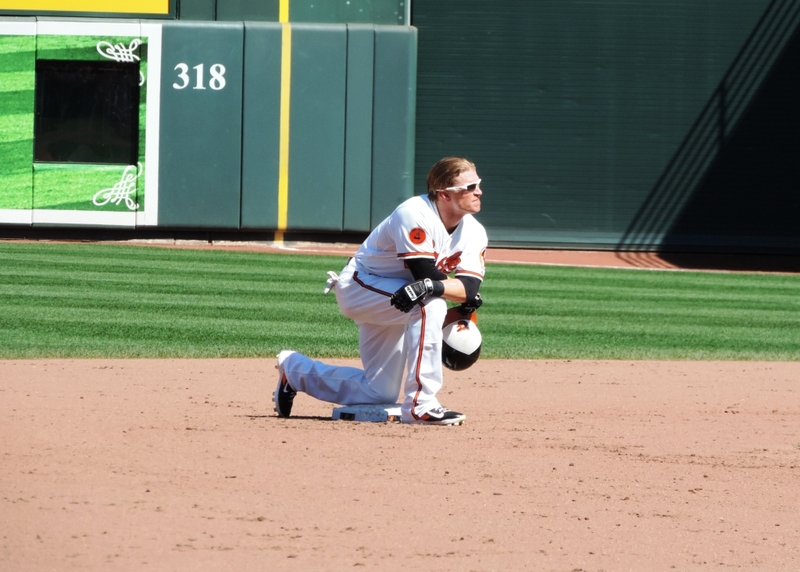 Thanks to Orioles closer Gregg Olson, who shared this 30-second recap online. Otherwise I’d have no video to share. The Orioles are surrounded by former players today – like Jim Palmer, Boog Powell, Rick Dempsey, and Cal Ripken – who stay close to the team and remind fans of the O’s two World Series championships (in ‘66 and ‘83). 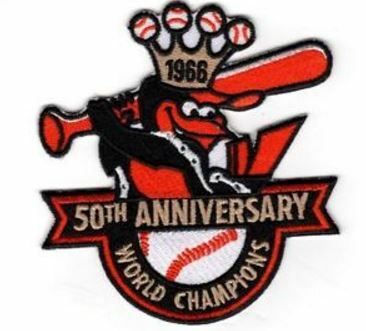 This season the O’s are celebrating the 50th anniversary of their 1966 trophy with special events and promotions. So, maybe the 25th anniversary of that understated, but still wonderful, four-man no-hitter has gotten lost. And, that’s a shame. Because nothing says teamwork like a no-hitter shared. There have been 295 no-hitters in major league baseball. Babe Ruth threw one. And, yes, dear Orioles readers, Ubaldo Jimenez threw one for the Rockies in 2010. And, on July 13, 1991, Bob Milacki, Mike Flanagan, Mark Williamson, and Gregg Olson threw one, too. 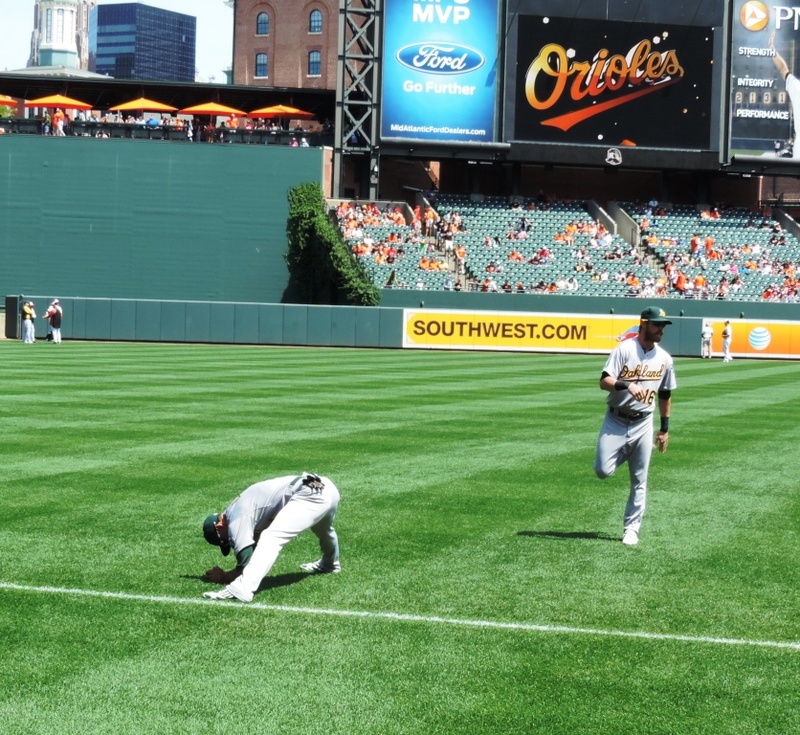 One A’s pitcher – and former UVa Hoo — tells us about life on the DL. Two Dodger’s pitchers you may have heard of. And, three home runs – a dinger, a moon shot, and a slam – from a Met. Here’s your Free Baseball* 1-2-3 Edition. Sean Doolittle, Oakland A’s reliever, former University of Virginia Hoo, and native South Dakotan (that’s the fancy-pants Dakota), has spent much of this season on the disabled list. And, his heartfelt piece on ESPN.com this week about life on the DL is a must-read – for baseball fans, of course, but also for anyone who has had to heal from a serious injury and has had to battle to get back the life their injury took away. “I’ve found that in this game, all you can ask for is a chance,” he writes. Read here. Technically that’s three Dodger’s pitchers, but Brandon McCarthy is writing specifically about Zack Greinke and Clayton Kershaw, and his piece this week on ESPN.com helps explain why they are two of the best pitchers in the world and we are not. Last night, the brand new New York Met, traded from the Tigers just a couple weeks ago, came through with three home runs against Colorado – a solo homer, a two-run homer, and a grand slam. If he could have mustered up a three-run shot, he would have hit for the Home Run Cycle. I’m not even sure that’s a thing. That added up to seven RBI … and I believe he snuck a stolen base in there, too. There you go … 1-2-3. 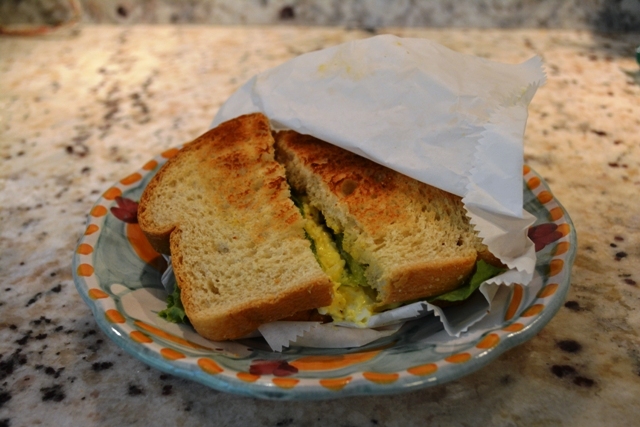 There are few things as wonderful as an egg salad sandwich on a summer Friday when you’re not working and everyone else is. Because, as with many turns of phrases, I am using “salad days” incorrectly. And, so I thought “salad days” simply meant good days. Like seeing an Orioles walk-off home run against the Oakland A’s last Saturday … or, that whole egg salad sandwich thing. 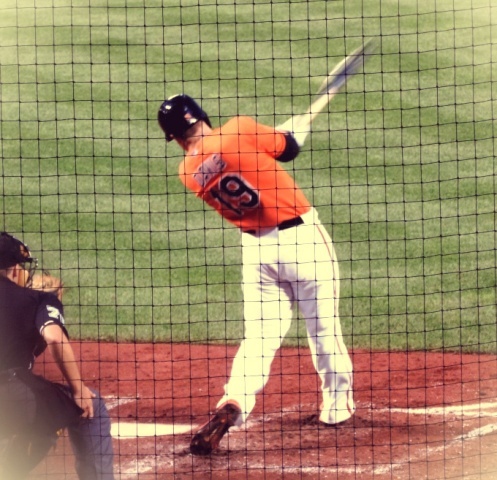 Chris Davis. Home Run Swing. Turns out, these are not salad days after all. 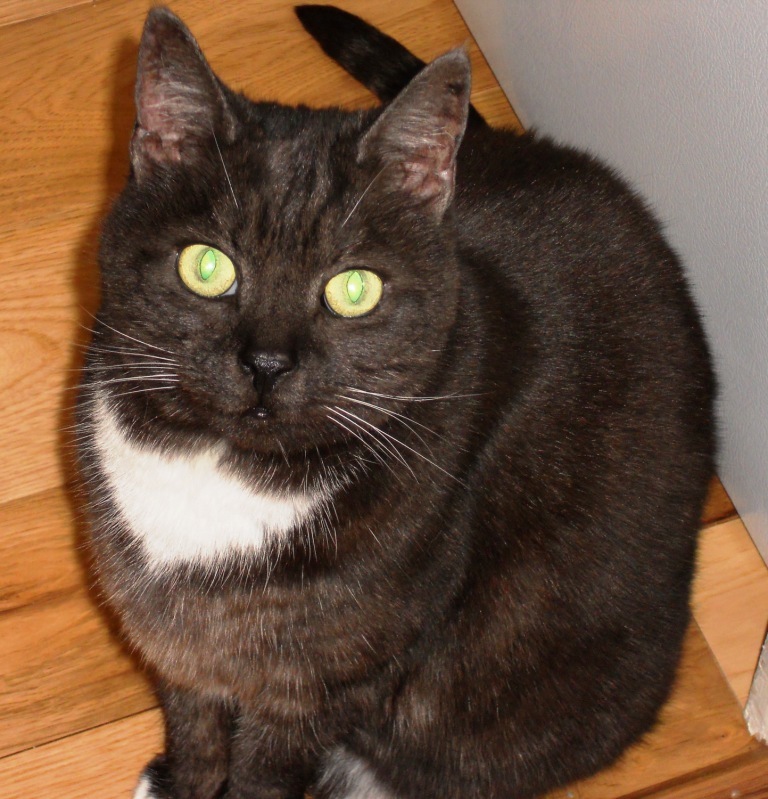 Salad days are the frivolities of our youth. 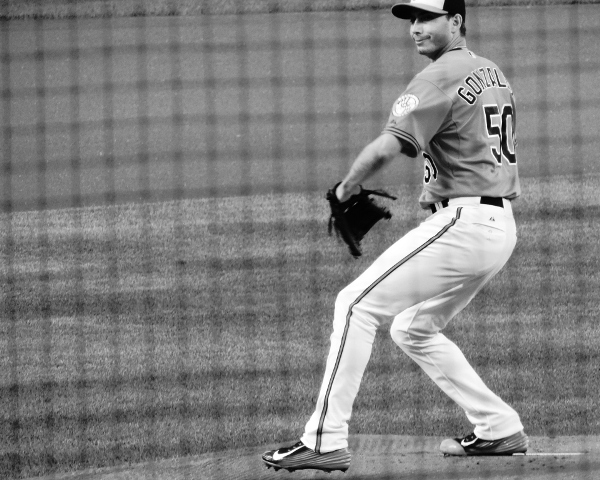 But, maybe Baltimore’s four wins against the Oakland A’s last weekend – outscoring them 34-13 – were salad days after all. Because, for a brief moment we O’s fans believed we had the post-season in the bag. Playing a worked-over, tired-out, reeling team like this year’s A’s will do that to you. You forget the worked-over, tired-out, reeling part and you just jump up and down every time you win. Such carefree, naïve fans were we. But, not all teams are reeling and you can’t play Oakland every day. In fact, the O’s have pretty much seen the last of the reelers this season. And, today, they’re a half-game back for the second Wild Card. Ahhh … the Salad Days of last Saturday. Look how happy we were! Raise Your Hand If You Want To Go To The World Series. 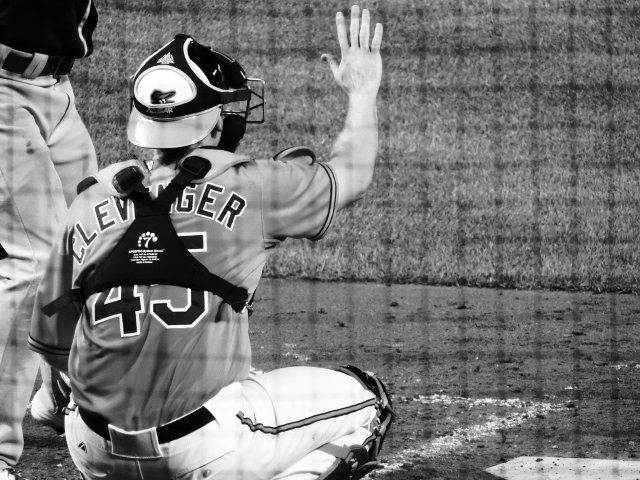 Steve Clevenger. Catcher. 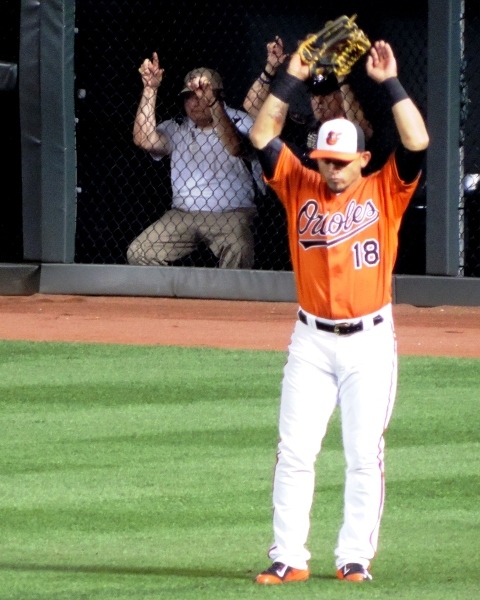 Parra, the new O’s outfielder, is doing the Wave with the fans! I know. I didn’t believe it either. That’s why I watched him do it two more times when the Wave came through the outfield bleachers. And, he did it each time. I love Mr. Parra. 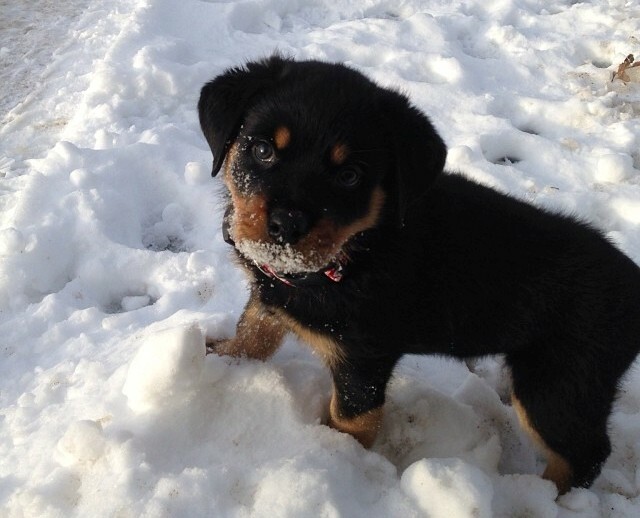 Can we keep him? Watch the walk-off home run here. And, what are salad days without pie? Meaningless. You know that egg salad? It wasn’t so great. First, the bread was sliced top to bottom, not on a diagonal, as perfect sandwiches are. And, it’s kind of made my stomach funny. Also, no pickle. What’s up with that? Although it was wrapped in deli paper, which is always a nice touch. Sure, they’ve only won one game since Oakland left town. Sure, there are some awfully good, surging teams that they will need to elbow out of the way to get into the post-season. 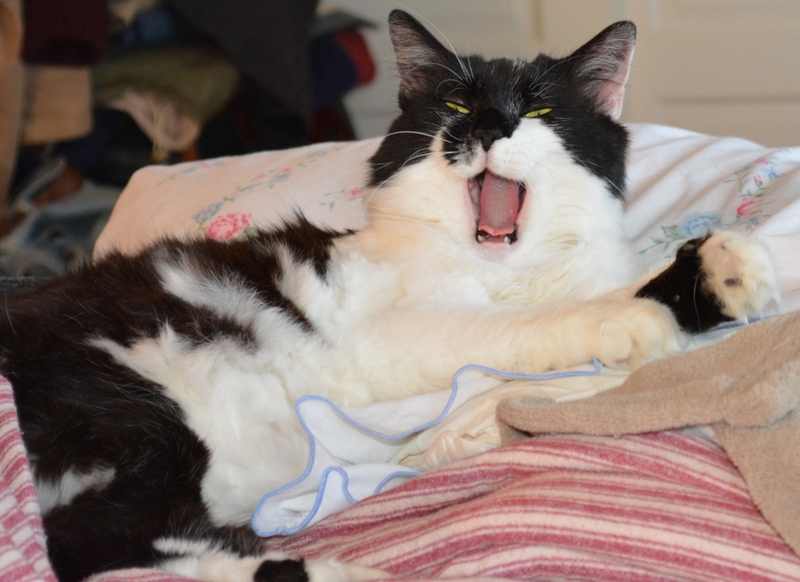 But, you know what they say – it ain’t over ‘til the fat lady sings. One of the greatest games in baseball history happened on the Fourth of July. On July 4, 1905, the Philadelphia Athletics and the Boston Americans played a doubleheader at Boston’s Huntington Avenue Grounds. 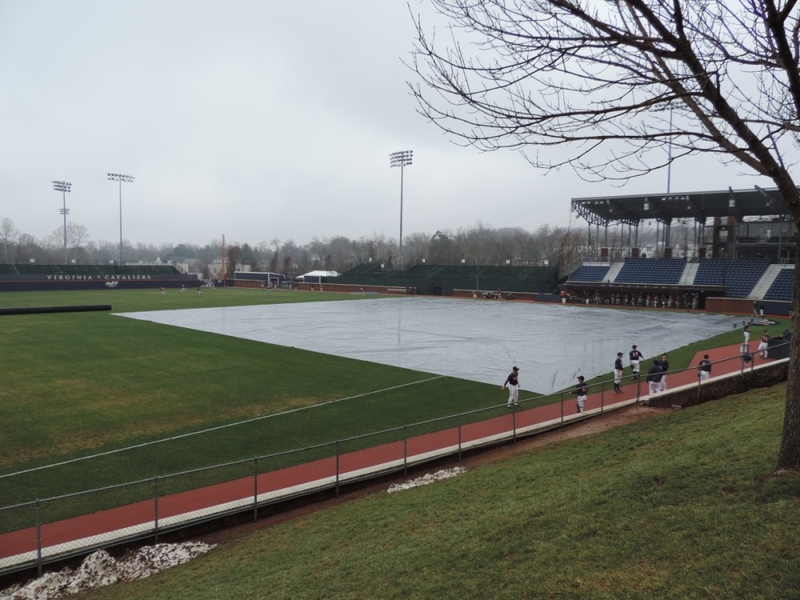 Doubleheaders, in those days before stadium lights, began bright and early in the morning. The A’s took the morning game 5-2. 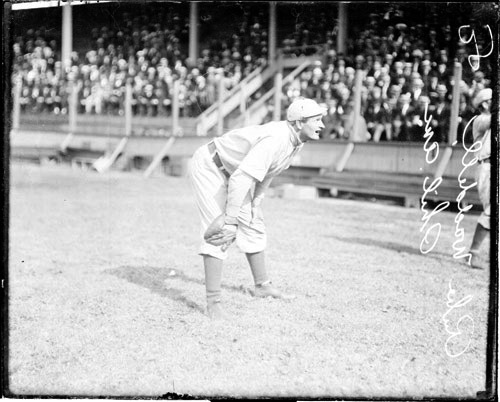 At some point late in the game, the A’s quirky lefty Rube Waddell came in, pitched in relief, and got a couple outs. This would be of only passing note, except that Waddell then started the afternoon game. And, pitched a 20-inning complete game. And, won. Beating Cy Young (who also pitched all 20). Every game your team wins is a great game. But, this really might have been the greatest. Twenty innings pitched by two of the greatest pitchers ever. Waddell later estimated that he threw 250 pitches in that single game. Cy Young thought he pitched slightly fewer. (1909) Permission: SDN-055366, Chicago Daily News negatives collection, Chicago History Museum. Our great-grandparents were crazy (and dangerous)! 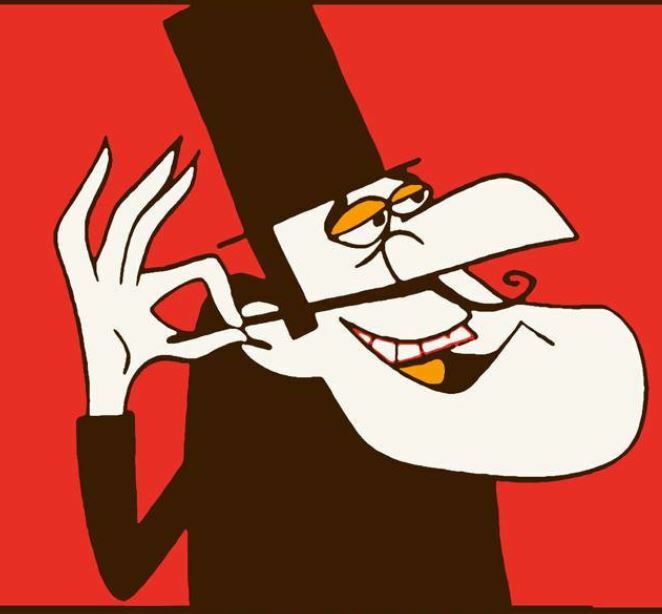 Waddell was nicknamed “Rube” because he was thought to be a little slow, a goofy, country bumpkin. Young was nicknamed “Cy” – for Cyclone – because it was said he threw fastballs so hard they would destroy the wooden grandstand walls. But, his pitching itself, including a powerful fastball and deceptive curve, reflected a focus and control that he lacked in other aspects of his life. On at least one occasion, he was so “on” that he shooed his outfielders out of the game and proceeded to strike out the side. Cy Young was far less colorful, except when he pitched. 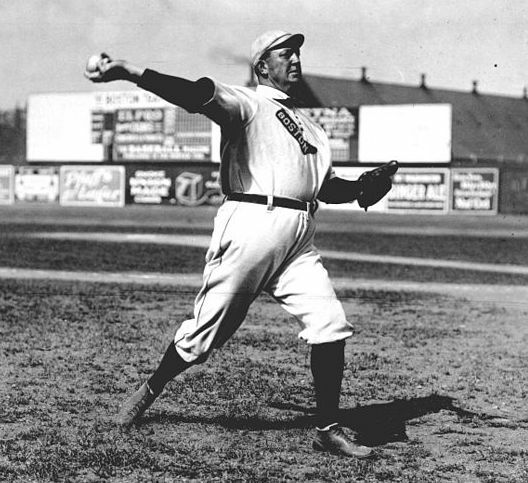 He threw the first perfect game of the modern era (against, wouldn’t you know it, the A’s and Waddell in 1904) and won 511 career games, the most by any pitcher ever, which is why pitchers today vie for the Cy Young award and not the Rube Waddell award. Here’s your 20-second 20-inning recap of that Fourth of July game. The Americans went up 2-0 in the first. The A’s tied it up with a two-run home run in the sixth. Then, for the next 13 innings, nothing. 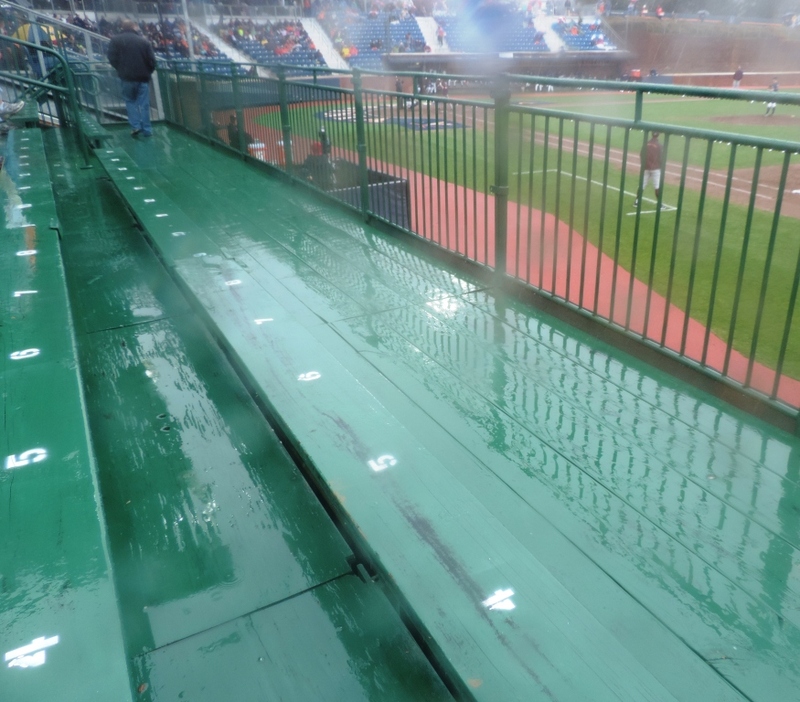 Finally, sometime before dark, in the 20th inning, Boston – and Young – faltered. A couple Boston errors, and a batter hit by pitch, allowed the A’s to cobble together two runs, and a victory. The glove Waddell used that day is in the National Baseball Hall of Fame. Both Waddell and Young are in the National Baseball Hall of Fame. The Philadelphia A’s moved to Kansas City in 1955 and Oakland in 1968. They are currently 52-33, the best record in baseball. The Boston Americans are now called the Red Sox. They are currently 38-47. 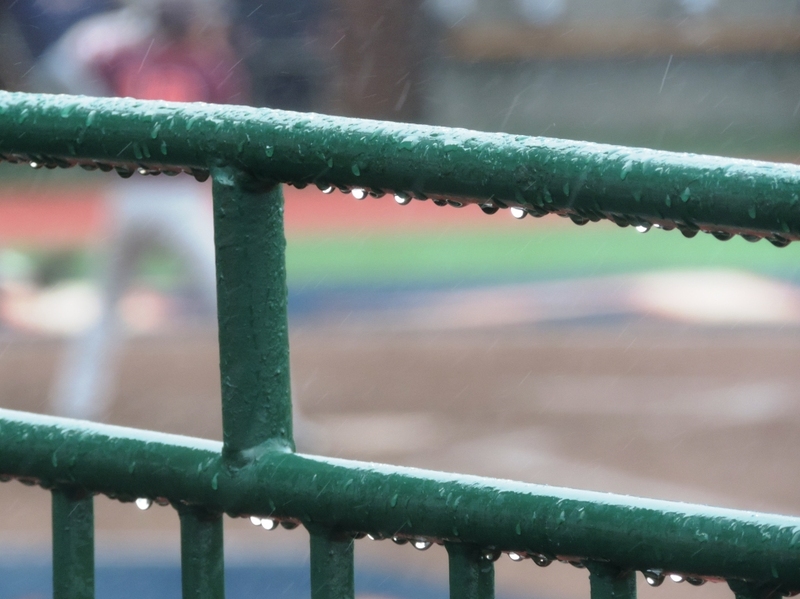 Their Fourth of July game today with the Baltimore Orioles has been rained out. Doubleheader tomorrow! 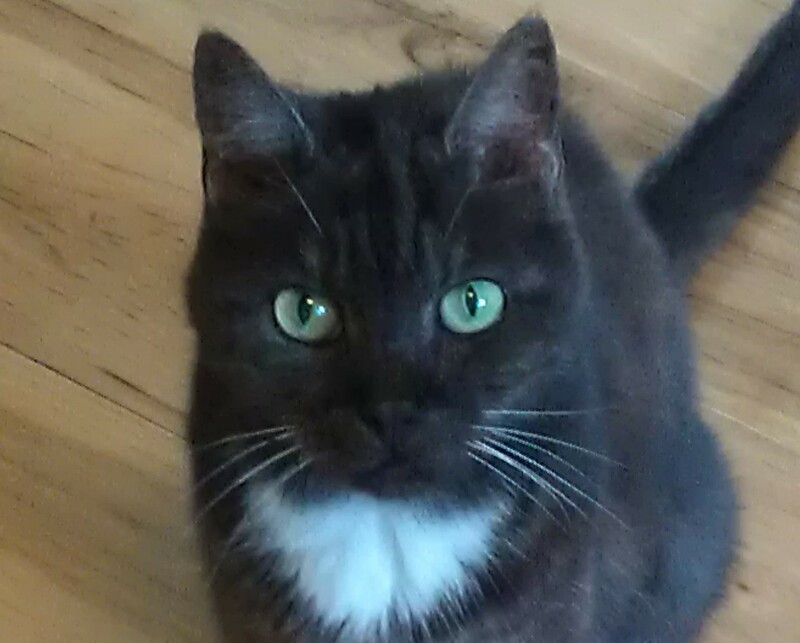 Oh, hey … one more thing! Waddell went 0-for-8 at the plate in that 1905 game. Only one other player has gone 0-for-8 in a game AND gotten the win. And, it was against Boston, too. 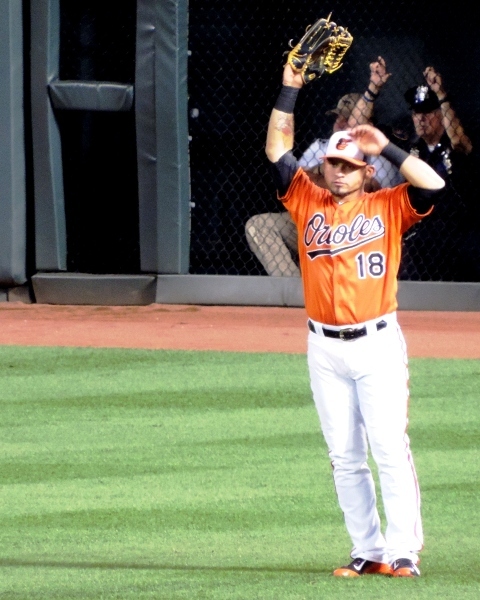 The Orioles’ Chris Davis, the designated hitter, was moved to pitcher at the end of a 17-inning game against the Red Sox in May 2012 when the team ran out of available pitchers. He hadn’t ever pitched in the big leagues before. He pitched two scoreless innings. He got the win. He hasn’t pitched since. Watch the two-minute highlights here. The Baltimore Orioles look like the guys who might deliver a truckload of mulch to your house. The O’s look like the guys who will change the oil in your car, put the gravel on your driveway and push the snow off of it. Ordinary guys. Neat? Not Neat? Close call. So, no wacky allowed in Birdland. No wacky at all. But, back to the Orioles. I appreciate Baltimore’s working guy thing. I like that the sports world gives the Orioles no chance … no chance … to do anything in the AL East this season. As the Orioles will tell you (when they’re not tidying up their mustaches and memorizing the dress code), they like this fly-under-the-radar thing. No expectations in April will, of course, make their almost-assured World Series championship in October that much sweeter. They are allowed neatly groomed mustaches, they have a ping-pong table, and on super hot days they get to wear shorts for batting practice. Other than that, they keep the crazy locked down tight in the clubhouse. 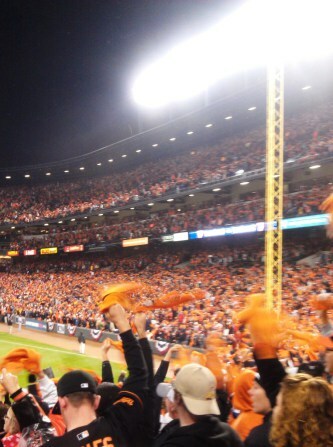 You won’t see any goofy television commercials from Birdland. So, check out some new sweet, sassy ads from other teams. Here’s Minnesota Twins’ legend Kent Hrbek giving playing tips to Joe Mauer. And, Felix Hernandez is King. The Giants, overachievers that they are, have a bunch more and you can see them all here. They picked up a lot of talent in the off-season. Acting chops, too. Who knew? 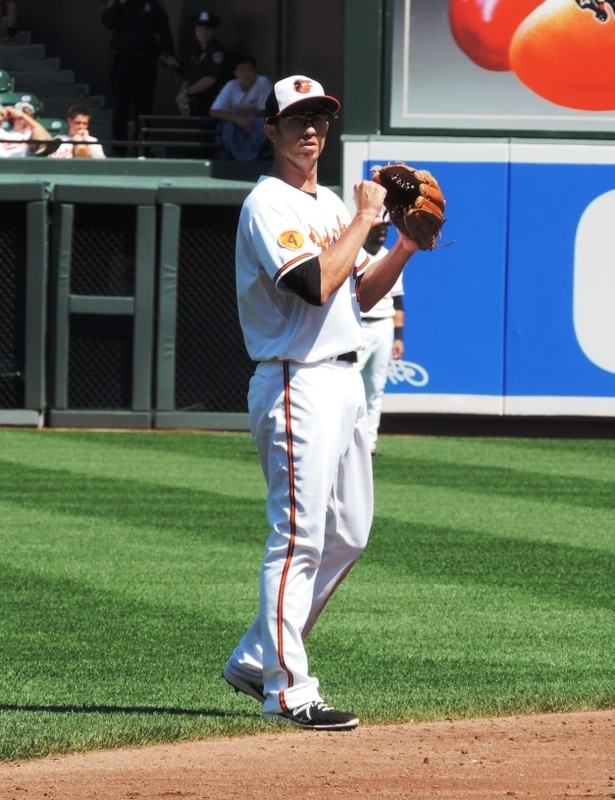 Here’s the Orioles’ newest starting pitcher Ubaldo Jimenez when he was with the Colorado Rockies in 2011. And, here’s the Orioles’ newest home run smoosher Nelson Cruz when he was with the Texas Rangers in an ad for a video game in 2010.